Irish Shamrock Birdfeeder $25.00US Simply adorable and unique. This weathered bird feeder is adorned with shamrocks. Perfect for your garden or porch. 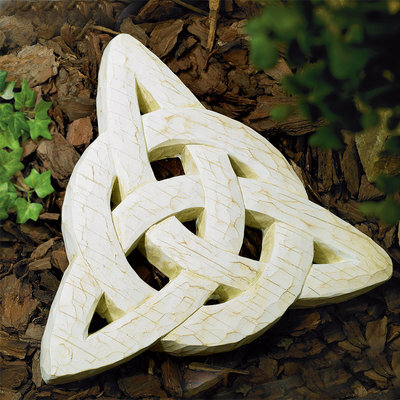 Trinity Garden Stone $30.00US The classic Trinity Knot is now a unique outdoor accent. Garden stone is crafted of a durable concrete material with an eye-catching white-washed finish. Protective white box. 12 1/2" x 11 1/2". 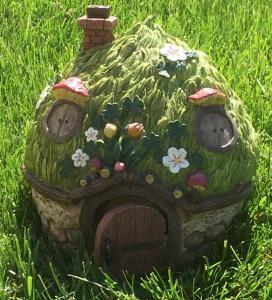 Fairy & Leprechaun Stone Home $45.00US FAIRY & LEPRECHAUN HOME OF STONES & PLANTS. WORKING DOOR. 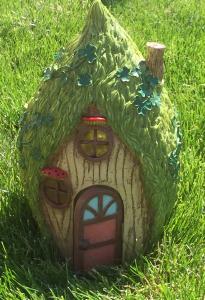 MADE OF RESIN 9" X 8.25" X 8.5"
Fairy & Leprechaun Tree Home $50.00US FAIRY & LEPRECHAUN HOME IN THE TREES WITH WORKING DOOR. MADE OF RESIN 8.5" X 8" X 12.75". THE PERFECT GIFT FOR ANY PACIFIC NORTHWEST IRISH HOME! Shamrock Lantern $27.00US SHAMROCK SOLAR HANGING LANTERN. CHANGES 3 DIFFERENT COLORS. Perfect for any Irish Garden! 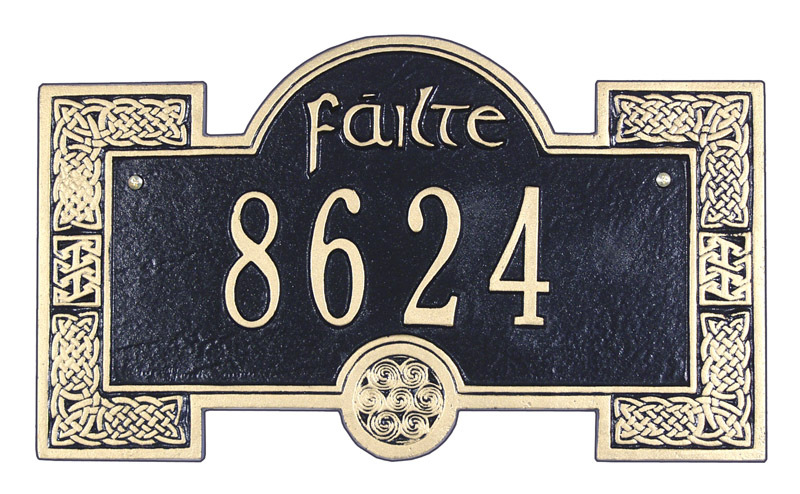 Failte Number Sign $105.00US Classic Failte Number Sign. 15.25" w x 9" h. Available in Black/Gold or Green/Gold. Most of Whitehall's products are crafted of rust-free recycled aluminum, while other Whitehall items use fine metals such as copper and brass which are used to make our Classic Directions Weathervanes. Whitehall Products has been making high quality items for over sixty five years. Please allow 3 weeks for delivery of this item. 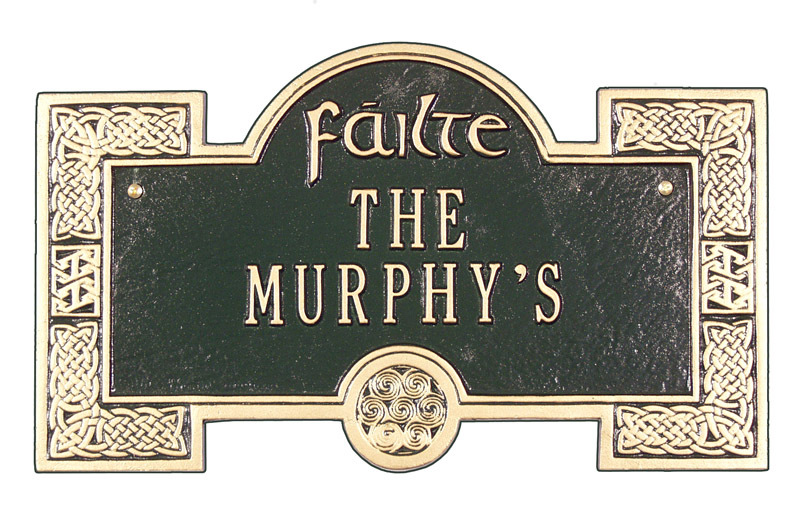 Failte Personalized Sign $105.00US Classic Failte Personalized Sign. 15.75" w x 9.75"h. This sign in includes the words Failte and The and we add an "S" at the end of your name. Available in Black/Gold or Green/Gold. Most of Whitehall's products are crafted of rust-free recycled aluminum, while other Whitehall items use fine metals such as copper and brass which are used to make our Classic Directions Weathervanes. Whitehall Products has been making high quality items for over sixty five years. Please allow 3 weeks for delivery of this item. Failte Welcome Bell $130.00US Classic and Quaint Welcome bell with an adorable Shamrock at the top. Black/Gold. Wall mount only. 13.75" wx 15.25"hx 7.75"d. Most of Whitehall's products are crafted of rust-free recycled aluminum, while other Whitehall items use fine metals such as copper and brass which are used to make our Classic Directions Weathervanes. Whitehall Products has been making high quality items for over sixty five years. Please allow 3 weeks for delivery of this item. 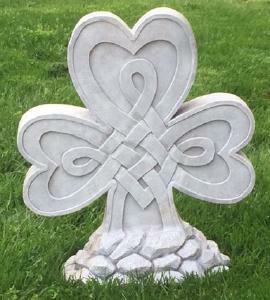 Celtic Sundials $75.00US Simply perfect for any garden or pathway. Make your garden a Celtic Land. 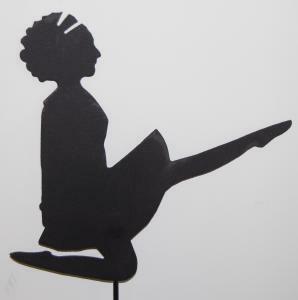 Available in Bronze or Verdigris. 12" diameter. Most of Whitehall's products are crafted of rust-free recycled aluminum, while other Whitehall items use fine metals such as copper and brass which are used to make our Classic Directions Weathervanes. Whitehall Products has been making high quality items for over sixty five years. Please allow 3 weeks for delivery of this item.